I want to announce that we just combined our two popular packages (Complete Web Designer and Complete Web Programmer) into one mega training package: Web Developer from Scratch. This is by far our most comprehensive video package, with over 62hrs of video training that covers everything from basic web design, all the way to advanced PHP programming! 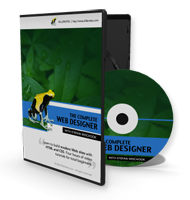 This easily the best deal you can find out the Web if you are looking to build a career as a web designer or web developer/programmer. The most amazing thing about this package is the price – you get $344 worth of training videos for $179.99! If you were even thinking about getting into a lucrative career as either a web designer or web programmer – NOW is time to start your training today. Why is PHP the best web programming language? PHP is the most popular database driven language today and many of the Web’s top projects are built using PHP. This includes WordPress, Joomla, Drupal and many forums and shopping carts. If you know PHP, you will be able to work with these much more easily. PHP hosting is super common and cheap. Enough said. PHP runs fast, is easy to learn and you can find good PHP programmers more easily than say Java or Ruby programmers. Why? There are just a lot more to choose from. That’s why we teach PHP and make it a priority in our training courses – we like to stay practical.